Sleep specialist Zeo Inc has officially launched the Zeo Sleep Manager, a new mobile sleep monitor that pairs with your iOS device during the night to provide a graph of how well you are sleeping. 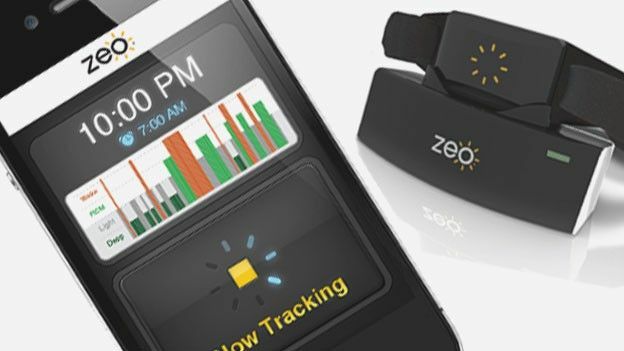 Using a highly accurate headband to track your progress through sleep stages from wake, to deep sleep through periods of R.E.M and light sleep, the Zeo Sleep Manager wirelessly transmits recorded data via a Bluetooth connection to a free to download iPhone application. As well as presenting users with a comprehensive graph of how they have slept the system also utilises SmartWake Alarm technology to wake users at an optimised time throughout a preset window. Those using the systems can also upload their sleep data to the Zeo website creating personal targets to monitor lifestyle effects (caffine consumed, exercise done) on personal sleep patterns. “Getting enough R.E.M and deep sleep can really help improve both health and general performance, but before Zeo, consumers would need to try to visit a sleep lab and have electrodes glued to their head to be able to see this sort of data,” said leading UK sleep expert Dr Chris Idzikowski. “Now you can view daily graphs showing how you sleep in your own home, meaning you can take control." Set to hit the UK on October 26th, the Zeo Sleep Manager, which is to be made available via myzeo.co.uk will set wannabe owners back £89. What do you make of the Zeo Sleep Manager, must have personal assistant or unnecessary gimmick? Let us know via the comments box below.